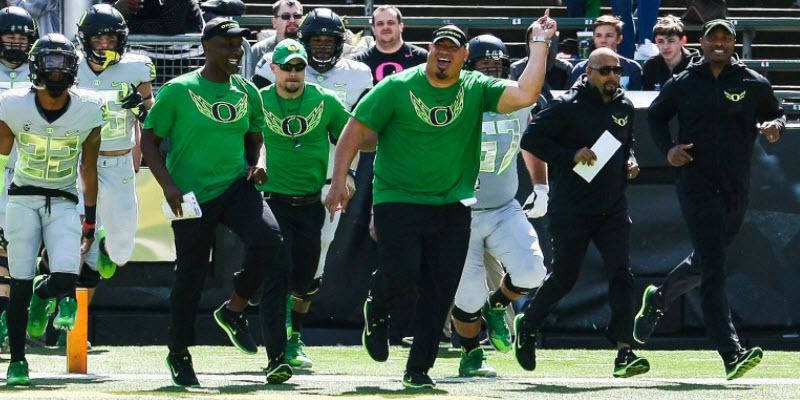 Oregon fans have received so many gifts and pleasant surprises from this new Willie Taggart coaching staff, and they continue arriving at a pace we cannot seem to keep up with. For my Monday editorial, I wish to pass along what I believe is the biggest immediate impact we will see this fall. To be clear, this would not be present were it not for the amazing skills of this diverse group of football professionals. First of all, has Oregon ever had six 4-star recruits who have verballed to the Ducks as of June 15th? Let me give you perspective: according to the Duck Sports Authority (Rivals.com) tabulation of recruiting (which I have the most confidence in), our beloved Ducks only had five 4-star recruits in total signed for the entire years of both 2014 and 2016 under Mark Helfrich. When Oregon ran the 3-4 defense under Jerry Azzinaro and Nick Aliotti, they made do with the personnel on hand. Fortunately they had stud defensive ends in Taylor Hart, Arik Armstead, and DeForest Buckner, but never had the “plugger” in the middle at Nose Tackle that is so essential for an effective 3-4 defense. You must have a NT who can demand double-teams and blow up the line of scrimmage, thus freeing up others to make plays. Watch Josh Tupou, No. 58 blow up a play. What you need is a nose tackle like Colorado’s Josh Tupou, No. 58, who at 6’3″ and 325 pounds could change plays. Watch the painful video below as Tupou blows Oregon up. He is in the center of the defensive line and is designated by the red arrow above. When Oregon ran the 3-4 defense before–the nose tackle at that time weighed about 275 pounds, and although he implemented technique well? He could not change plays as you see above. The game-changer brought in by the new coaching staff is heralded freshman, Jordon Scott, who at 6’1′ and 335 pounds, (he is reportedly trimming down a bit from his listed weight) has a powerful and low center of gravity. 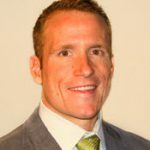 The best damn Talent Evaluator of Oregon websites, Mike Kelly, created a superb article for FishDuck.com recently. 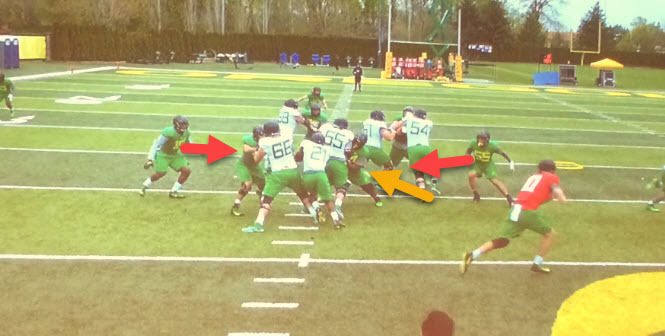 Scott is the nose tackle (yellow arrow above) who is standing up the Ducks center (the starter on the O-Line last year) and is showing perfect form in his first practices with the Ducks! Note how he has exploded upward from his legs and lower back and has his hands placed inside of his opponent, which is crucial from a power standpoint. He is not buried below by the offensive lineman, but Jordon has his head to the side to see the direction of the play. Note also the tiny gap above for Royce Freemen (No. 21) to run. If the center (No. 55) had moved Scott out to where No. 61, No. 54 and No. 68 on offense had moved their defenders? The running room would be enormous, with tons of options for Freeman. Jamming the middle as Scott does above makes it easier for the linebackers (red arrows above) to play downhill to the running lanes. One player can change a defense and limit the running play to a short gain, thus forcing a passing down in the upcoming play, which, based on the down and distance, the defense will be prepared for. That is why Jordon Scott is my biggest impact selection from the new coaching staff. Everyone knows the defense has to be better next year, and this key component will have a much bigger effect on results than anyone in the media will acknowledge right now. Look for a killer article on Wednesday where a former college player, Justin Samples of FishDuck.com will give us insight into the new Oregon defense like none other, after we learn some new techniques from a Coach Ruskin Fiegenbaum analysis article tomorrow. Thursday is a treat, as Coach John Edge will offer us some inside information about coach Willie Taggart, and what to expect from Oregon in September. As stated previously, we are publishing three to four tasty articles per week, and they will run between Monday and Thursday. Having the coaches, and just a few writers on board provides less content, but quite satisfying for all when published (what I envisioned is becoming reality). My friends, it is still fun and we will have some juice in our articles unlike anywhere on the web, both now and this fall.